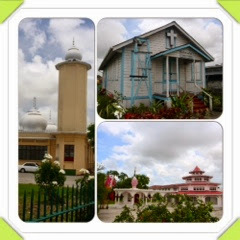 Religion played a very important role in my life as a child growing up in the country of my birth, Guyana. I was not super religious, but I was certainly awed by the idea of the holy and the sacred, and as such I approached things religious with a careful reverence. Of course, like any child, I was concerned about what was in store for me after death, though that concern did not particularly influence how I lived my young life. And while there was some influence from Religion, the major influence was essentially from the values instilled in me by my parents. There were three places of worship in my village - St, Peter and Paul's Catholic Church (where I served as an altar boy), a Hindu temple, and a Mosque (where I first learned Arabic). I attended all three by choice (and with the support of my parents) and loved every minute of those experiences. I was always captivated by the visual and olfactory references of the first two and just as awed by the absence of those references in the latter. The one significant thing I gained from my association with these three religious institutions was the concern for the well-being of others, especially the poor. The pleasant memories of my boyhood involvement in those traditions will never be forgotten. I shall forever cherish them. Of the three, I feel more closely connected to Hinduism, especially since being exposed in my adult life to Krishna's conversation with Arjuna in the Bhagavad Gita, part of the larger Mahabharata Epic.